This week there are going to be a few days with double posts and this is one of them. It turns out that the week-long "Holiday Chaos" challenges at Catch the Bug are going on this week and I plan to play each day. Today, the challenge is to use the sketch they provided. I turned it on end because of the shape of the image I wanted to use. 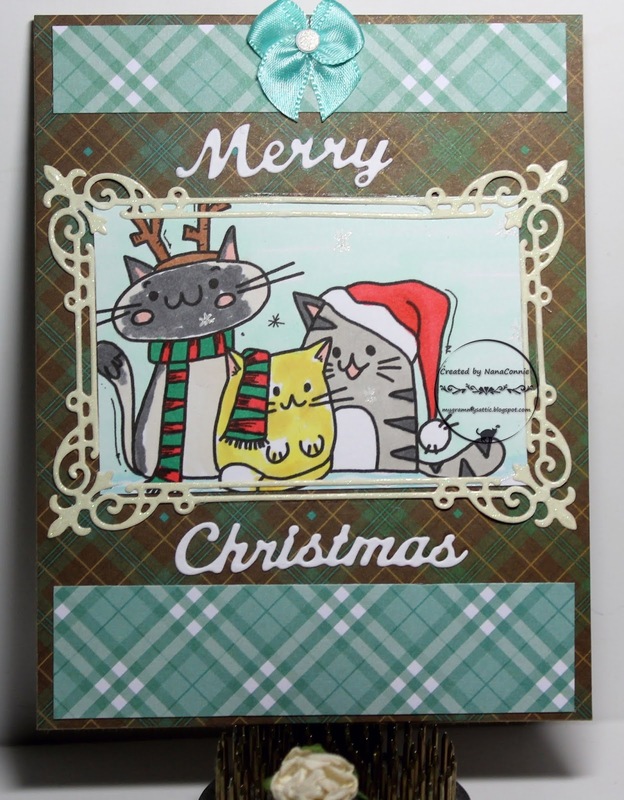 I colored those three singing cats with ProMarkers, cut the image with a simple rectangle die from Tonic Studios, and cut a frame for it out of sparkly CS with a die from Bo Bunny. The plaid papers are from Your Next Stamp. I cut the sentiment words with a Die Versions die. With all that plaid, the only embellishment needed was one of my hand-sewn, signature bows. The punched dot in the center of it is covered with sparkle gel ink but, sadly, it doesn't show in the photo. So cute!! 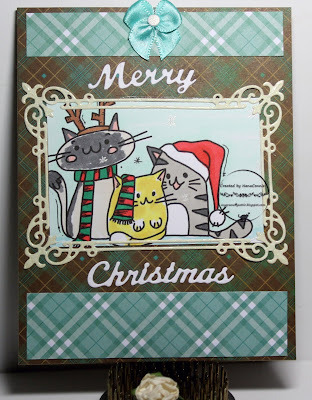 Love those little kitties and your card design. Just love these kitties and your interpretation of the sketch. This is such a cute card. Love the kittens. Thank you for playing along at Creative Inspirations, good luck and I hope you will join us again. Love the die you used to frame that image of the cutie pie kitties!! How cute!! Love the die you used to frame them! I have one like that but it is a square; I think I would use the rectangle so much more often. Thanks for playing with The House That Stamps Built. Great take on the sketch and lovely coloring. Thanks for joining the Holiday Chaos of Catch the Bug! A very cute christmas card with these lovely cats. Thanks for joining us at Addicted to Stamps. Holiday Chaos - Shopping Humbug!